The 2017 Glenna Luschei Prize for African Poetry award went to Juliane Okot Bitek for her book 100 Days (University of Alberta Press), which was selected by judge John Keene. I had the opportunity to interview Luschei Prize-winning Juliane Okot Bitek about her book through email correspondence. Juliane holds a Master’s Degree in English and a BFA in Creative Writing, and she is currently a PhD student in the Interdisciplinary Students Graduate Program at the University of British Columbia’s Liu Institute for Global Issues. 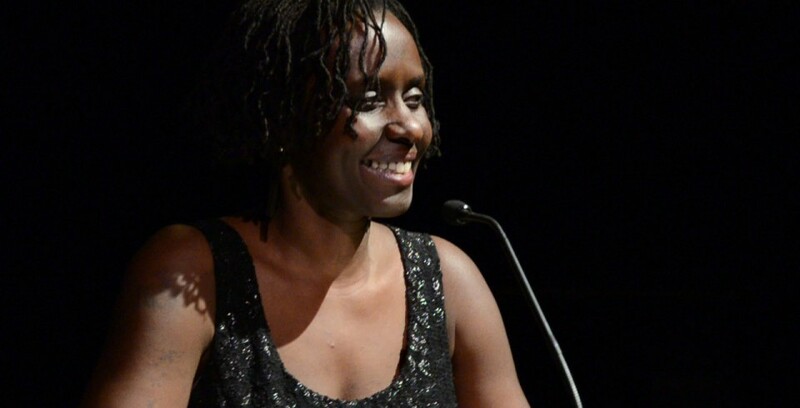 Her book, 100 Days, is a poetic response to the 1994 Rwandan genocide. Juliane wrote a poem a day for a hundred days that were inspired by the photographs of Wangechi Mutu. In 100 Days, she utilizes vivid imagery combined with the rhythms of traditional, oral storytelling to explore the past and the ways we remember it. MATTISON MERRITT: What kind of journey do you want this collection to take its readers on? JULIANE OKOT BITEK: I would like the readers to imagine the porous nature of a term like “100 days,” how there are days that led to the first day and that there were days and days after the hundredth day. I would like readers to imagine the voices of people who we remember as having gone through a hard time that lasted those hundred days. What conversation could we have? To what would we listen? MM: What kind of topics and issues do you enjoy exploring through poetry? JOB: I don’t know that there are restrictions to topics or issues to explore poetically. I’m interested in how language can be twisted, shaped, stretched and controlled. Poetry allows me to bend language to fit the issues that I would like to explore. I’m most interested in poetry as an art form that does political work. MM: What was the most challenging part of putting this book together? JOB: Believing that the book was going to exist. MM: What kinds of preparation did you do for this book? JOB: I had no special preparation. Before the Rwandan genocide of 1994, I had been thinking about the need to write about what I was witnessing as an adult woman living in these days, about the war in my homeland in northern Uganda. When the genocide happened, that war had been going on for at least eight years and continued unabated for more than a decade afterwards. For twenty years, I had not written anything about the genocide and not enough about northern Uganda, but I had never stopped thinking about this responsibility. MM: Were there any specific images or stories that inspired your work and made it into the final publication? JOB: The posting of a photograph by Kenyan American artist, Wangechi Mutu, on social media, about #Kwibuuka20, inspired me to begin writing. MM: What is your favorite part of the writing process? JOB: For me, there is no favorite part of the writing process. I’d say, I’m most grateful while I’m writing. MM: What was the most rewarding part of creating 100 Days? JOBL: I have not thought about 100 Days in terms of rewards. It was a difficult book to write. I am surprised and grateful for the attention that this book has gotten. MM: What art, writing, music, movies, or other types of media have inspired you recently? JOB: My “recently” extends by decades. I’m continuously inspired by the writing of American novelist Toni Morrison and Canadian poet Dionne Brand but I’ve been awed of late by the American novelist Jesmyn Ward. I admire most of the Black women artists who use art to challenge social memory and therefore our present. Artists Wangechi Mutu and British Kenyan Phoebe Boswell inspire me to look, to understand what I’m looking at and think about how my life is shaped by the image as representative of a bigger narrative. MM: Besides writing, what else consumes your time? JOB: I’m writing a doctoral dissertation, teach at Fairleigh Dickinson University, and spend time with friends and family. Writer Juliane Okot Bitek is a PhD Candidate with the University of British Columbia’s Liu Institute for Global Issues in Vancouver. Her work has been published widely online and in print in magazines including Arc, Whetstone, Fugue, and Room of One’s Own, and has been anthologized in Great Black North: Contemporary African Canadian Poetry and Revolving City: 51 Poems and the Stories Behind Them. Visit julianeokotbitek.com. Copies of 100 Days may be purchased online from the University of Alberta Press, an Indie Bookstore, or Amazon. Mattison Merritt is a student at the University of Nebraska and an intern for the African Poetry Book Fund. She also works for the Nebraska State Education Association as a Legislative Intern. Outside of her life as an intern, she is on the UNL Speech team, does standup, and loves reading crime fiction.